Sun in Pisces may be too sensitive to meet Moon in Aries’ need for a challenge. The warrior Moon thrives on conflict, while Pisces prefers to go with the flow. 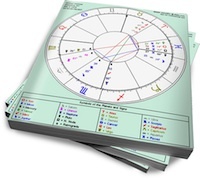 However, depending on the rest of his chart, Sun in Pisces can be dynamic and forward-moving (if he finds his true purpose). Moon in Aries may decide to go along for the ride, and she can channel her fighting instincts to fuel Pisces’ goals. Sun in Pisces has a higher purpose, but it may be difficult for him to find it. His transcendent energy amplifies creativity and vision, but can also blur his focus and ambition. Purposeful Sun in Pisces can manifest his dream, and is a romantic, sensitive lover. Shadow Pisces can be a vague, wounded partner who escapes his responsibilities and drifts through life. Whether or not he’s living out the healthy side of his sign, his partner will find that a light approach works best. Confronting him head-on will result in his denial and/or withdrawal. Moon in Aries feels comfortable when something fires her passion. Although she can’t live in a constant state of conflict with her partner, a sure sign that she’s bored or unhappy is her attempt to start a fight. Moon in Aries needs a productive channel for her restless energy, and her partner should accept that even when she’s feeling good, she can be blunt and impatient. Sun in Pisces may be taken aback by Aries’ abrupt changes of mood. What he interprets as hostility will simply be Moon in Aries expressing her needs. As he sidesteps her demands, she’ll push forward. Eventually, Sun in Pisces may withdraw entirely. Much depends on her Sun sign (especially if it moderates her Aries fire) and his Moon sign (especially if it gives him the ability to push back). If other planets in their charts agree, Moon in Aries can act as her Pisces lover’s background ambition. She can add her passion to his vision, and together they can bring life to something special.